When my children were small, we used to make Christmas gingerbread houses out of graham crackers, clean meat trays and small milk cartons. But in today’s world gingerbread kits are widely available for most holidays as “convenience products”. My daughter loves gingerbread so the marketers definitely have her attention. In fact this past Sunday as my husband and I watched the grandchildren (ages 5, 3 and almost 1) while their parents attended a training at church, there on the kitchen counter sat this box promising a creative masterpiece – the turkey kit that my daughter had provided for something to do after dinner and Grandma would help them. I remember looking at the kit with a bit of concern because construction isn’t an area I’ve been gifted with. So after dinner, my husband took the baby over to the carpet to watch and we broke the box open. In front of me lay several gingerbread cookie pieces, some gummy type of candy, a package with a few m&m’s and a packet with the smallest round candy balls I’ve ever seen. I was looking for the frosting, thinking there would be a can of ready made but instead there was a small bag of powdered sugar with these directions – whip an egg white until firm (what? are you kidding me), add sugar and a few drops of vinegar. I needed to find the mixer and the beater, I needed to divide the candy in two bowls (already foreseeing the future of those little ball candies all over the place). But there was no way I could tell two children looking expectedly at me that we weren’t going to make the turkey gingerbread. The mixer was found and two chairs were pulled up to the kitchen counter, safety instructions were given and my grandson became the power source of the Kitchen Aid Mixer while my granddaughter was in charge of the lever that locks the machine down. Two roles they were delighted to take on; this was happiness for them. We talked about how important it is to start out slow when working with powdered sugar because it can go everywhere. They were very good listeners and soon Caden was asking me if he could increase the speed to 4 miles an hour (the four on the speed control) and Maisie was ready to unlock/lock so we could scrap the sides of the bowl. For me the day had already been filled with baking and decorating the baby’s birthday cake for later in the week; and I’d cleaned up several colors of frosting in pastry bags. 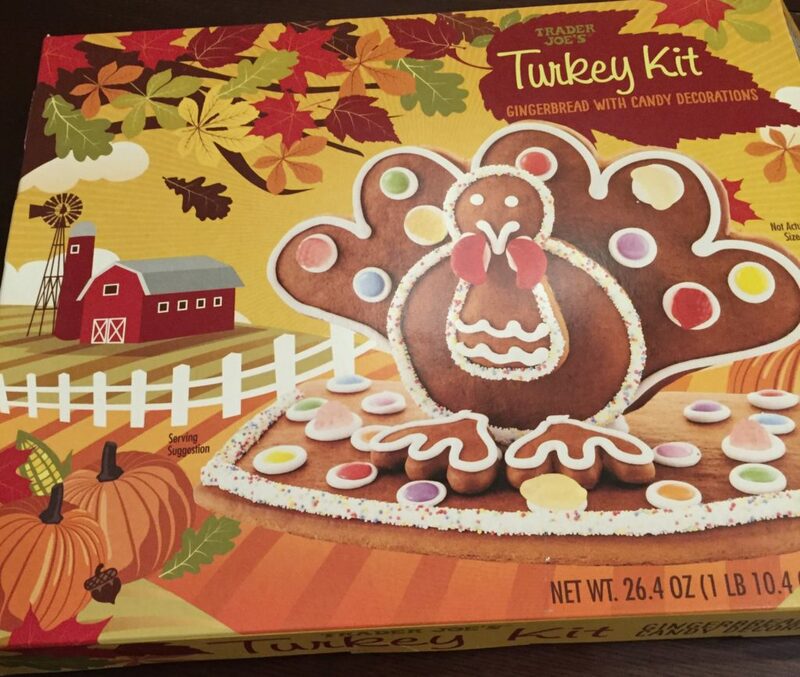 But the frosting we made for the turkey was similar to thick cement – I kept looking at the front of the package thinking how did they get the outlining of frosting around the pieces so the tiny ball candy could adhere to it. If you’re a grandma and have been in a similar situation, I know you’ll understand how sometimes you miss essential pieces like the pastry bag – although I don’t think the frosting would have come out very easily – when managing a project with two little ones. I found a butter knife and started loping frosting on the turkey cookie pieces only to discover those little candies just rolled off onto the floor. Then my grandson’s elbow caught his bowl (yes, full of the little rolling devil candies and off they went on the floor.) Caden glanced over for my reaction. By this time, I laughed the laugh of a person knowing that this would soon be over. The only thing left was for the limited gummy and m&m candy to be pushed into the unattractive gobs of icing I had sloped onto the turkey because what the children really wanted to do is eat the 12 pieces of candy the kit had allotted each of them. While they pushed the candy into the drying cement frosting, I was still trying to figure out how to brace the bird so it would quit toppling over. Finally the candy that was adhered 5 minutes before had been picked clean by the children’s hands and was sitting in their little tummies, sticky hands had been washed, teeth brushed and Charlie Brown’s Thanksgiving was on the tv. I gave my husband the option of getting the baby ready for bed which included a diaper change or cleaning up the turkey fiasco which had left the dining room and kitchen a disaster. He chose cleaning up the destruction the now naked turkey had left; and I wrestled with a wiggly precious boy getting clothes off – pjs on. While diaper changing I noticed Jesse pushing something back and forth with his tongue and discover a small piece of gray lego in his mouth. I am able to remove this and look forward to sitting in a dark room in a comfy rocking chair feeding him a bottle. 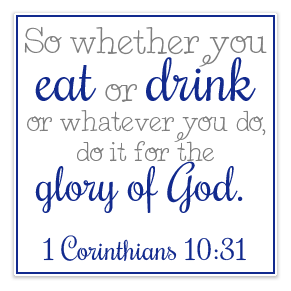 In the dark, I am in awe of my daughter and son-in-law – how do they do it day in and day out? I wonder how could a simple turkey gingerbread kit make me feel like I’ve been to battle and lost? In a brief moment of self pity, I even think why would my daughter do this to me? Soon all the children are asleep in their beds, their grandpa has headed home because he has an early bedtime; and I hear the garage door open. My daughter sees the turkey on the counter without any adornment except the splotches of frosting that look more like a bad skin condition and asks how the project went; the turkey mocks me. I told her from now on, I can’t do these type of projects with the children – it’s too much. These people who design these kits can’t have tested them out with real children and tired grandmas. No one in their right mind has you mixing up frosting with eggs – don’t get me started on the raw egg in edible frosting for children and those ball candies that are barely visible to the naked eye and then have the audacity to not stick to the frosting – there are no words. My daughter smiles at me and the turkey; then looks at the back of the box and explains when she has bought the kits in the past they always came with ready-made frosting and bigger sprinkles. 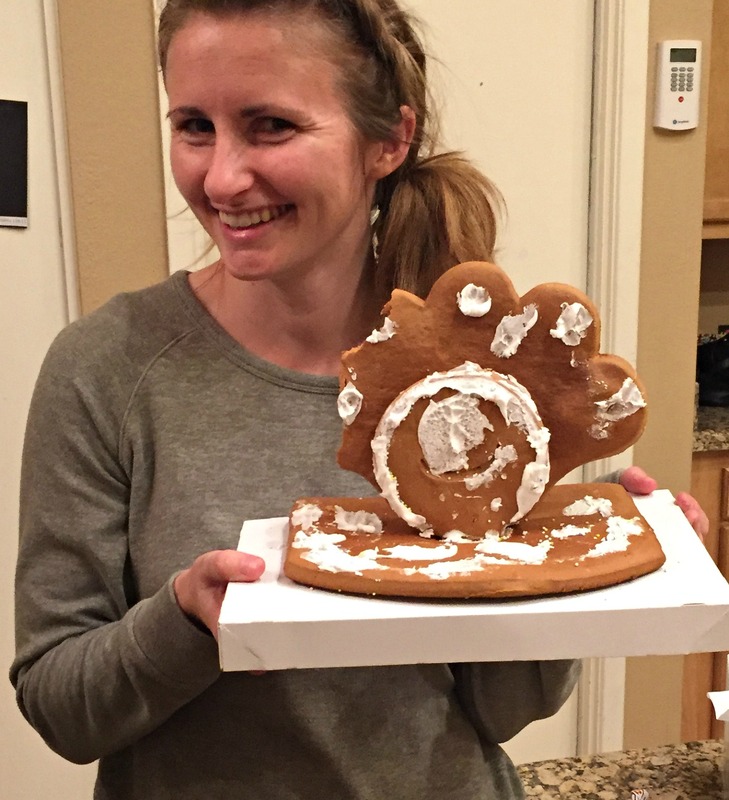 We laugh as Tamara begins breaking off pieces of the turkey cookie and saying how good it tastes. While her eyes glaze over from the gingerbread happiness, I repeat there will be no more gingerbread kits for this grandma. A note to the wise – if you see this kit in the store or in your adult child’s home – run! I found a version of this recipe years ago in a Taste of Home magazine and put my own twist on it. This recipe works well for potlucks, taking a meal to someone or just a bit of comfort food. Think about doubling the recipe – they freeze well. Preheat oven to 350 degrees. Prepare baking sheet with parchment paper. Mix first 7 ingredients well in a bowl. 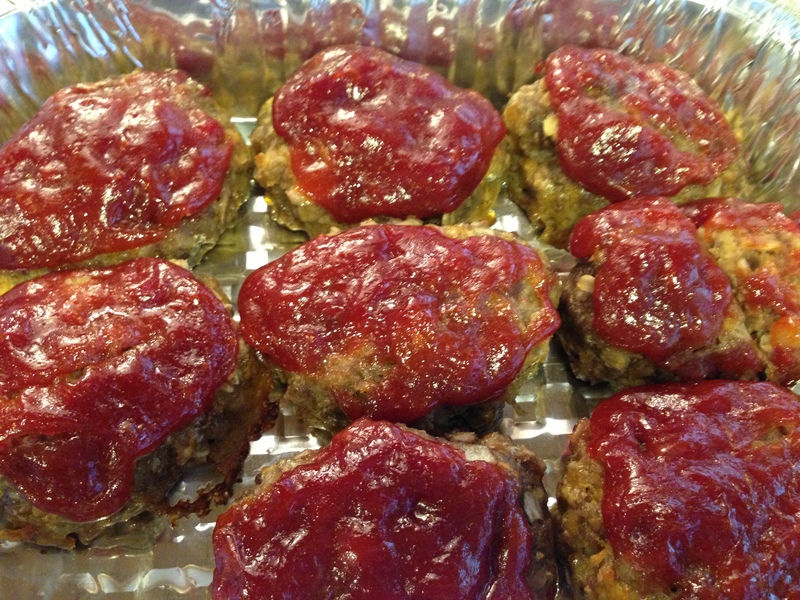 Form into 10 mini meatloaf. Mix last 3 ingredients in small bowl and top each of the loaves. Bake for 40-45 minutes or until done. Combine first 7 ingredients and mix well. To prepare mini meatloaves place meat mixture into a 1/3 cup measuring cup. 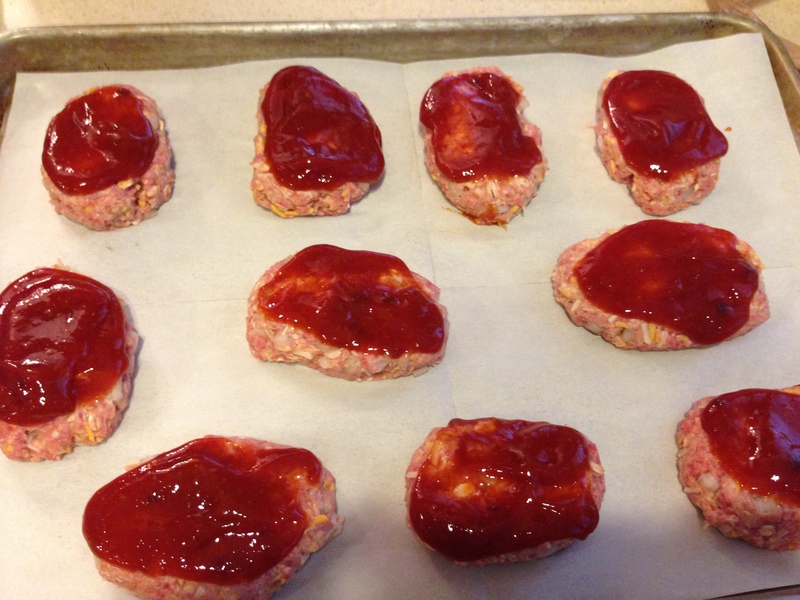 This will ensure that each meatloaf will cook at the same rate. 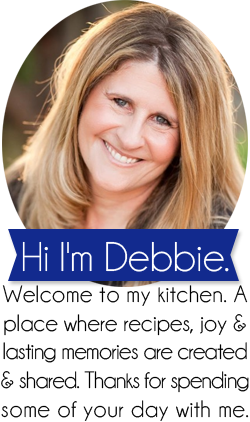 Form into a ball and then place on a cutting board and gently form into an oblong shape with your hands. 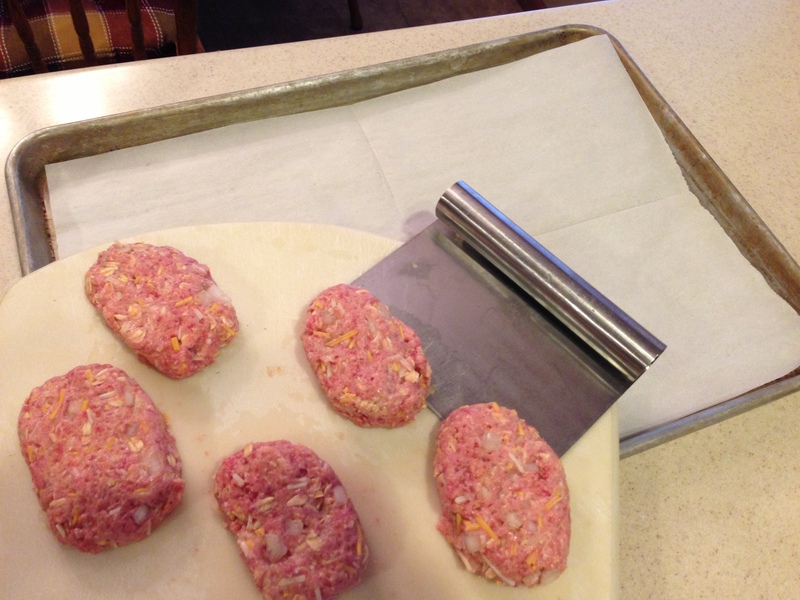 Remove the mini loaf with a multipurpose kitchen scraper and place on prepared baking sheet. I usually come up with 10 mini loaves. 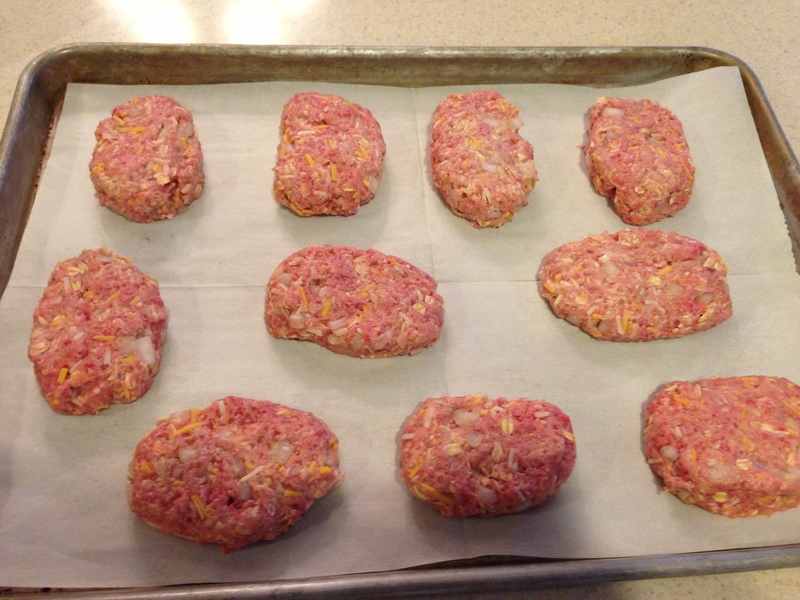 Bake uncovered for 45 minutes of until the meat is no longer pink and a meat thermometer reads 160 degrees. This is our new favorite meal. It’s easy and delicious and the pumpkin gives the chili a smooth, slightly nutty flavor. 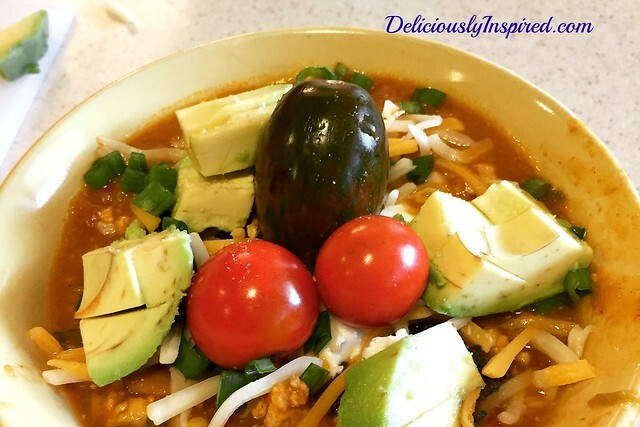 Decorate a bowl with green onions, avocado, tomatoes, cheese and a few crushed tortilla chips. Heat oil in a large pot over medium heat. Add onion and brown for about 5 minutes. Add in turkey and break into small pieces until fully cooked. Add in garlic and green chilis. Add tomatoes, pumpkin, water, chili powder, cumin, salt and pepper and bring to a boil. Cook for 30 minutes, stirring occasionally. Ladle into bowls, top as desired and enjoy. The amount of green chilis, chili powder and cumin can be adjusted to your taste. 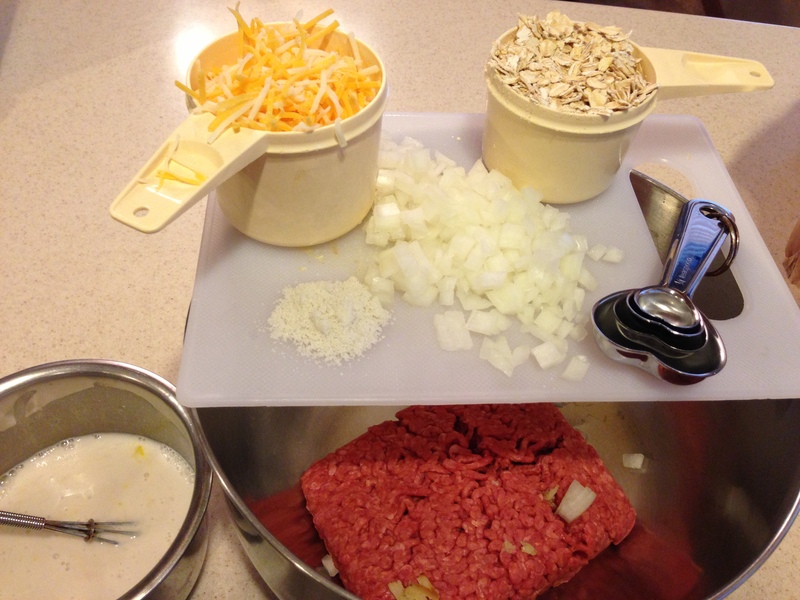 When browning up ground turkey, I do several pounds at once and then package in freezer bags - this makes the putting together of this dish in the future a breeze. You can do the same with onions.